Down from heaven I saw another mighty angel in a cloud , with a rainbow over his head, and his face was like the sun, and his feet as pillars of fire. 2 And he had in his hand a little book open: and he set his right foot upon the sea , and his left on the land, 3 and cried with a loud voice as a lion roars : and when he had cried , seven thunders uttered their voices. 4 And when the seven thunders had uttered their voices, I was about to write : and I heard a voice from heaven saying unto me, Seal up what the seven thunders have said and do not write . 5 And the angel which I saw stand upon the sea and upon the earth lifted up his hand to heaven , 6 and swore by Him who lives forever and ever , who created heaven and the things that therein are, and the earth and the things that therein are , and the sea and the things which are therein , that there should be time no longer : 7 But in the days of the voice of the seventh angel, when he shall begin to sound, the mystery God should be finished, as he announced to his servants the prophets. 8 And the voice which I heard from heaven spake unto me again , and said, Go and take the little book which is open in the hand of the angel which standeth upon the sea and upon the earth. 9 And I went unto the angel , telling him to give me the little book . And he said : Take and eat , and thy belly bitter , but in your mouth it will be sweet as honey . 10 And I took the little scroll from the angel’s hand and ate it , and it was in my mouth sweet as honey , but when I had eaten it , my belly was bitter . 11 And he said unto me, Thou must prophesy again about many peoples , nations , languages ​​and kings. We’re at the midpoint of the great tribulation . According to Daniel 9:27 This is the time that the beast breaks his covenant with Israel and reveals his satanic fury . God protects the Jewish remnant during the first three years and means , and the global beast has authority over the past three and a half years later . We have already read that Satan has taken over the land greatly for three years, and has terrorized the land especially Christians with a great persecution . There is a hiatus between the sixth and and seventh trumpet. The seventh trumpet is the start of the cup of God’s wrath . 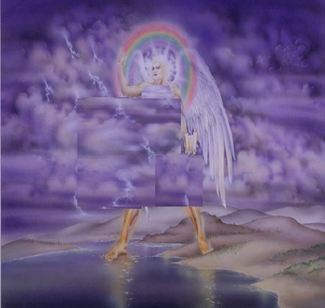 This special messenger ” strong angel ” coming down from heaven , wrapped in a cloud with a rainbow over his head is but our Lord Jesus Christ the angel of the Lord. 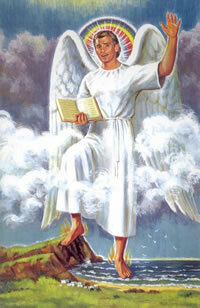 The description John gives us of this strong angel is the same as the glorified Christ in Revelation 1:12-16 we read . The cloud and rainbow refers to feet Fire 1:16 to 1:15 and the face like the sun at 1:16. Even the voice as we see in the lion also in Hosea 5:5 11:10 and Joel 3:16 . That voice you hear is not a voice of grace but of judgment. The “little book ” verse 2, takes about a big roll opened and in 5:1 is sealed . Read verses 9-11 we see that this is a book of prophecies. And the prophets had declared this big roll and its prophecies. Perhaps this ” Booklet ” is the sealing message of Daniel 12 , 4-9 and will now open for it to pass. The Lord standing on the sea and on the land claim sign , He is claiming what is his. ! We do not know what the loud word says or what the thunders said, and we’re not going to speculate either. John was told to seal up the words of thunder , this is the only revelation that the book reveals . This vision of John makes it clear to us that Christ is in control and will soon fulfill of all God’s purposes . The scene starts when Christ raises his hand and says that there will be no more delay. ” TIME AND NOT BE MORE ” . We’ve read that the souls under the altar were asking : “How longer ?” .6:10-11 . And we saw how the answer: “Since there will be no further delay ” Sinners say and talk about the delay of the return of Christ because it seems to them He does nothing to prevent the calamity this world is coming to , so they ask Him to do something ? 2 Peter 3 . This period of delay is nothing more than a last opportunity for many more to repent of sin to enable them to be saved. hrist tells us in 11:15-19 that God will complete its program with the sound of the seventh trumpet. I should also mention that many scholars think this ” Little Book ” contains the mystery of God . It’s not just enough that John sees the ” Booklet ” in the hand of ” strong angel ” Angel of God who is the same our Lord Jesus Christ but must seize it, this is an illustration of how we may make His word part of our inner person. 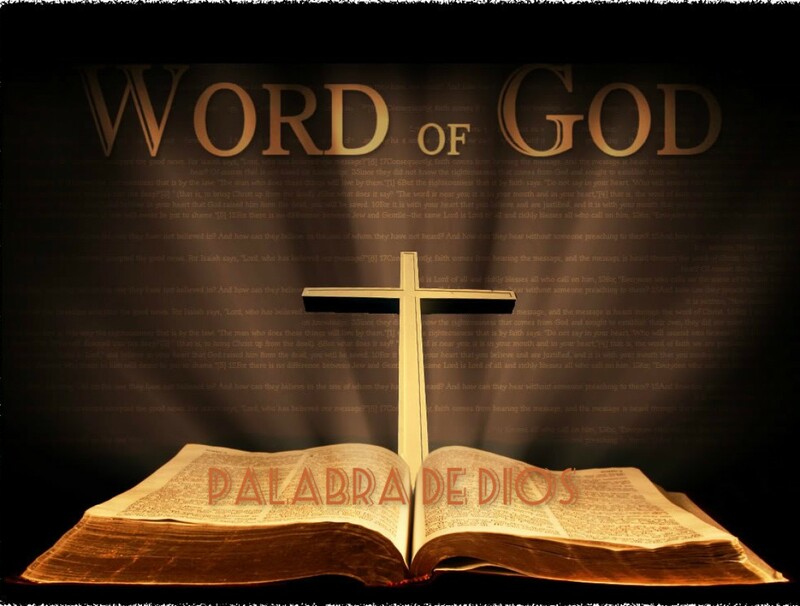 We see in Matthew 4:4, Ps 119:103 , that the word of God is our food . We must take it and assimilate it before it can make us any good . The effect of eating the ” Booklet ” had a double effect on John , first was sweet for your palate but bitter in his stomach. John is blessed to know that God will fulfill his promises , but b feeling the bitterness he realized the suffering that will come over the next three and a half years of the tribulation. In the next lesson we will read John prophesy about many peoples, nations , languages ​​and kings.